Syria has been living the past three years completely engulfed in rampant terror and threats to the population, which are actively being used to demoralise the administration and force it to leave the political arena. The fact that the military campaigns have a localized nature does not lessen the severity of their consequences within the current dire situation. The overall feelings of confusion disorganise society, while the uncertainty about the present and a fear for the future create psychological pressure that robs people of their trust, leading to the creation of even more barriers between them. The overall disorder only worsens the deterioration of the economy and is accompanied by as immense amount of negative consequences. Threats are coming in from practically all sides, yet the persistent domestic difficulties caused by a lack of water or energy are not the most overwhelming. The greatest threat is the uncertain future of the younger generation, which is what families are increasingly worried about. This is better understood especially if one is to remember that almost half of the population in the country is under the age of fifteen. Numerous children have been dragged into the conflict. Presently, the religious aftertaste of the war not only rips the youth away from education but also fills their heads with religious dogma that was traditionally foreign to the secular Syrian society, which became radically politicised during the second half of the last century. It was not too long ago that most of the mosques would not be full to busting, even on a Friday. Another problem is also quickly approaching due to the current military setting. The rates of disease and mortality are growing while the number of injured and wounded has exceeded any previously imaginable norms. The health system, as with the education system, is no longer able to handle its entrusted duties. The country has lost over sixty hospitals, medical centres and outpatient clinics, the pharmaceutical industry is on the verge of collapsing and the medical personnel, whose numbers have noticeably decreased, is working itself to death. The education system has fallen into a deep crisis due to the fact that three thousand schools have been destroyed, while the remaining two thousand are being used for refugees and the homeless. The number of students has decreased almost two-fold while the ranks of the teaching staff have also noticeably thinned out. 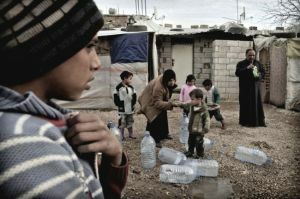 Essentially, Syria is standing on the brink of a humanitarian catastrophe, while the meagre, as compared to the need, injections of aid are split between the refugees and those residents who remained, although the situation for the latter is not any better than for those who have been displaced. The extension to all of these destructive processes came in the form of social differentiation and the creation of a large army of active out of control elements. The weakening of central power gives rise to the worst negative events, which are most clearly embodied in the higher criminal rate within Syria, but they can also develop into anarchy and even the degradation of social relations into archaism. Syria has always had a very law-abiding society. However, the present has become an age of developing bandit groups and the creation of heretofore unheard of elements akin to the mafia. They are gradually laying their hands on authority in certain places and various abandoned assets, creating a foundation for their future. They will secure a place for themselves in the future at any cost. So far, their activities are not especially noticeable amidst the open military warfare and the overall turmoil. However, this does not mean that it will remain invisible when the situation changes for the better and that it will not provide another crack in the relationship between the government and society, altering the conflict-free – from a criminal standpoint – atmosphere of the previous decades. This is especially true since the overall poverty is starting to become a fairly fertile ground for the more steadfast criminal societies to expand their activities while also seeing the creation of criminal brotherhoods from the social drop-outs and incorrigible individuals. The destabilisation of the situation and the growing threats to the population during the previous year have led to a revival of tribal connections and other links of this kind. This is caused by people yearning for safety and desiring to find some sort of defences against the terrible events befalling them. The easiest way to accomplish this is by connecting with your family or clan. According to popular beliefs that are once again gaining ground, more guarantees can be found in the formerly capable “power unit” such as the clan, a whole tribe or even an entire confession. One need only to reanimate them and to use the benefits of collective self-defence. As early as a year ago there was already a clear tendency in Syria towards concentrating the representatives of the Alawite community within the coastal Syrian cities. This is difficult to accomplish because the families are spread all over the country and the members of this religious group have long since lived separately. However, the dire situation forces people to overcome their tribulations, difficulties with residence and other obstacles one way or another. Here, in their native lands, the members of a kindred group feel more sure of themselves and are counting on their united strength to oppose the Muslim radicals. This is not the only case either. There are more examples, although not as pronounced, where members of other religious groups are moving about the country and gathering into larger groups to oppose the pressure of the enemy forces. The strengthening of such collective bonds speaks volumes. Firstly, it states that in extreme situations of war, the tribe is starting to be seen as the only alternative to the government that can preserve social order and oppose the foreign threat to a certain territory. It then turns out that the tribal structure is preparing to take on the function of fighting the foreign – with respect to itself – forces. Essentially, a long lost and unnecessary in normal society phenomenon such as the physical defence of its members is now being reborn within the social practices of the community. This duty of the community is currently valued as being more important than mutual assistance in the home, in business, in career or in other such matters, which were essential during the former peace time. Essentially, if such a tendency were to really take hold, it could be seen as evidence that the social relationships are moving back to an archaic structure. After all, the division of the population according to a religious and tribal basis during the weakening of the government is a step back in societal development and a turn back towards the times that are the cherished goal of the radical zealots of Islamic traditions. From their point of view, returning to any foundation is a blessing and is to be welcomed. However, the movement itself rather bodes ephemeral benefits and is rather an act of desperation than a really effective method against the armed extremists. In principle, this is a dead end road, which almost underlines the weakness of the government and brings hope to the enemy. Syria’s experience shows that the destruction of modern government structures and economic institutions, regardless of the methods by which this is accomplished, is the quickest way to the deterioration not only of the economic foundations of the government, but also of an entire way of life. Retrograde tendencies quickly lead to a disintegration of society into separate enclaves with limited links outside their boundaries. This postpones the time when the population can be consolidated around any constructive idea that could lead to an exit out of this dead end civil strife. Presently, Syria has made the correct move in agreeing to destroy its chemical weapons. If the future events will be developing in line with this initiative then the extremists’ positions could be seriously shaken. This will strengthen the authority of the government and will help it focus on maintaining a vibrant and healthy fabric of society, preventing the proliferation of fault lines that are threatening to evolve into a national catastrophe.